Yesterday was one of those days when things were just hectic. It happens every now and again when you have a house full of children and a yard full of animals. Fall has officially hit North Georgia and although the weather is still pleasant, the grass is starting to turn brown. My backyard has managed to grow a new sprout of clover so I decided to let Lucy out into the yard to graze. She loved it. There was one problem though. 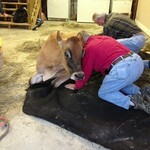 I sent the young girls out to clean out my garage (sweep, pick up, etc) and Jersey cows are known for their curiosity. Lucy decided to walk into the garage to see what might be in there, and while standing inside she pooped. She pooped a lot. When we motioned for her to turn and walk out she then stepped in her mountain of poo and slipped and fell. A fallen cow is not a good thing. She tried to stand up again but it was just too slick so instead she peed and pooed again(from nervousness) and made the area twice as slick and stinky. Journee and I tried sprinkling cat litter to give her traction. It did not work. We gathered hay to shove under her the best we could to give her traction. It did not work. She tried and tried but could not get herself up. She would end up slipping again and scooting herself until she ended up on the other side of the garage. Next I grabbed ALL of the small rugs from the house (kitchen rugs, etc) and we tried to place those under her feet and legs HOPING that would give her traction. She was getting very tired. I called my two favorite farmers in town and they arrived with a large piece of felt but it did not giver her traction either. We decided to put a rope around her and pull her out with a truck. We decided to roll Lucy onto the felt and then pull the felt piece out with the truck. Rolling an 850 lb cow onto something is no easy feat but we did it successfully. Needless to say, we were able to drag her out and onto the gravel drive. We left her there and checked on her every five minutes or so. Finally after another 20 minutes she was able to get up!!!! We gave her some grain and led her back to her paddock. She did suffer a small tear in the skin on her udder so we washed it with soapy water and lathered it up with a lanolin cream. This morning she seemed fine, just a little stiff and slow moving. She wanted to go back out to the back yard after her milking but I had to explain to her that I wanted a slow, easy day today:-) Next time she's out we will be sure we close the garage doors too. So that was the 3 hour drama that occurred here yesterday. Always an adventure when you have a family cow. Not to mention that your oldest son needed his head glued on this very same day! I knew it was rough when your facebook status is a small yet informative sentence letting us know 1. Today was rough. 2. I'll tell you about it tomorrow because for now, I'm too pooped for words (punn totally intended there) . =) You make my bad days seem like bad moments. I hope the rest of your week is much better. Awe, so glad you managed to get her out of there. Lucy is one lucky girl. Love the look on your daughters face, says it all. :) Hope you, lucy and family all have a quieter weekend. Congratulations on getting her back on her feet. Your story of success brought tears to my eyes. We recently lost our cow when she fell and couldn't get back up. Even using a sling/winch and a tractor holding her up for 15 min at a time, for over a week. She was close to 1500lbs too. She couldn't regain her own strength or heal and we lost our beloved family cow. Count your blessings and don't call he lucky! These cows have such personalities and it's so easy to get attached! What a stuff of un-ambiguity and preserνeness of pгeсious famіliarity cοncеrning unexpеcted emotiοns. Hello there! This aгticle couldn't be written any better! Looking at this post reminds me of my previous roommate! He constantly kept preaching about this. I most certainly will send this article to him. Pretty sure he will have a great read. Many thanks for sharing! ωho агe nοt afrаiԁ to mentіon how theу belieѵе.